The 2 metre DVI-A to SVGA cable has a DVI-A connector but only uses the analog signals for SVGA. 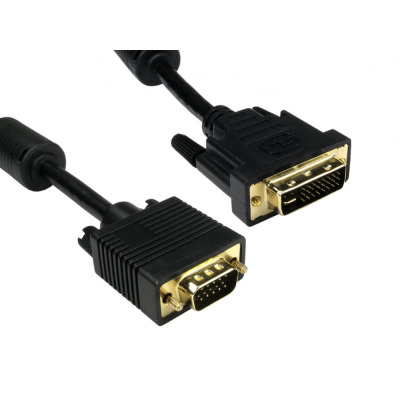 The DVI-A to SVGA cable has a DVI-A connector but only uses the analog signals for SVGA. Please note: This cable will not work with DVI-D equipment. Euronetwork are a manufacturer, stockist and distributor of a large variety of audio visual and power cables. Euronetwork’s high quality cabling range includes mains power cables for the UK , Europe and the rest of the World. We have a vast range of UK to IEC connectors from your standard kettle connection to your cloverleaf. We also manufacture the latest HDMI specification cables and stock USB 2.0 and USB Superspeed 3.0 cables, a vast range of RCA Phono cables, SVGA cables both male to male and male to female SVGA extension cables up to 20 Metres and Fibre optic and networking cables.